“ORIGINS OF THE TAROT” Book Review | MY SACRED JOURNEY . . .
Reading “Origins of the Tarot” was a body-mind-spirit resonance of Bliss with the Beloved for me. It is a rare book that touches so profoundly into the heart of our individual and collective soul. For years I have been researching and reading books that traced the history of Tarot, but none so far had touched upon what I knew were the deeper esoteric roots of the major arcana beyond medieval and Renaissance Europe that informed what I call “The Sacred Journey of the Soul”. I set upon my own search for material on the “Hero’s Journey” as described by Joseph Campbell, the alchemical transformation explored by Carl Jung. Looking to books on Eastern Philosophy, Hinduism, Taoism and Buddhism confirmed my sense that there was a relationship between Tarot and the Great Traditions of religion and philosophy. “Origins of the Tarot” is a complex and comprehensive treatise on Eastern influences and their relationship with Western philosophy and religion, leading up to and deeply formulating what we now call Tarot. 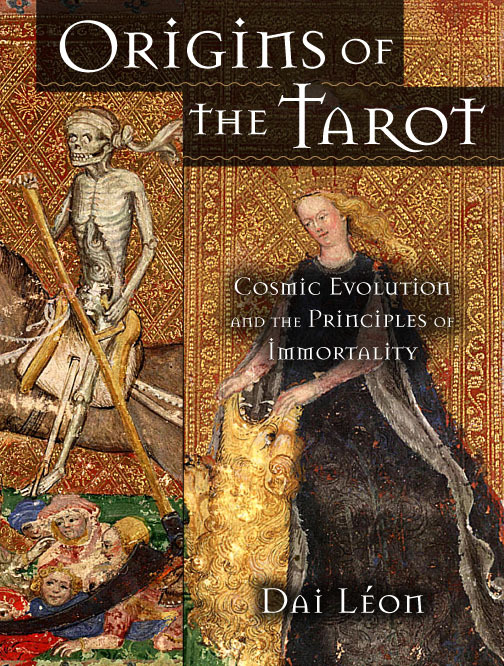 In essence, it traces the non-dualistic roots of Tarot from Europe, back to the East, along the Silk Road, and beyond. For those interested in the history of philosophy and religion, this is the equivalent of a college-level course with its expansive details. It traces a complicated confluence of crossed and criss-crossed influences from Indo-Aryan “shamanic cultures” to ancient Greek philosophy and myths, Buddhism, Taoism, Sufism, Neoplatonism, Kabbalah, Hermeticism, Gnosticism, Eastern Christianity, Western Christianity, and Celtic culture, including the metaphysical concepts of alchemy, tantrism, and Eros. My Tarot History poster, version #2, traces the lineage of influences, updated and expanded, based on this book. At it’s heart, this work is a philosophical study following the weaving of dual and nondual, what I call “Unity”, values as they stream together, influencing, sometimes repelling, each other throughout our history of evolution as intelligent beings. Tarot enthusiasts will find this is to be a radically different interpretation of the basic template of our modern Tarot’s major arcana. Yet, knowledgeable scholars of Tarot will recognize these deeper roots and how they informed the pre-Renaissance sequence and power of each Tarot Trump, or Triumph. When seen through the wisdom of nondual values as they move through the hierarchy of stages toward immortality, this preeminent template of Triumphs constitutes an amazing model of evolution, our spiritual potential reflecting back to us through the visual archetypes of the Tarot. For some folks Léon’s writing style may be circuitous, dense and difficult to follow. On the surface, it does not appear to apply a linear outline, but topics are well-rounded discussions of major concepts with their multiple influences. I particularly appreciate his vast knowledge, extensive references, and precise vocabulary. This is a must read for any serious student of Tarot wisdom. Special thanks to the Green Salmon and Village Bean for the many times you let me hang out, including after hours, to finish reading this hefty book. ©2009 – 2018 Katrina Wynne, all rights reserved. Nothing herein may be copied, reprinted, reproduced, or retransmitted in any media format without express written permission of the author. Great take on this book! It is the type of book that one keeps referring back to – it isn’t a one time read, and it isn’t for the faint of heart! It will certainly take me years to completely digest the extensive research and concepts in this amazing book. I just discovered your excellent review on Aeclectic.net and have now added a link. I’ve read this book, it’s amazing! Quite the eye-opener. Good review, btw, hope to see more soon! Thanks “Z” … I hope to post a variety of interesting articles on this weblog. I look forward to your comments. Thanks for the review that gets at the main ideas of this great work. It breaks away from all the psycho-tarot, Jungian, gnostic emphasis (some is valuable but too much of this) to tarot and evolution of consciousness deeply thought through, and to tarot in social with individual directions. Tarot becomes a springboard for “what we know and need to know about the world and ourselves.” Belongs with Tomberg’s Meditations on the Tarot– both take us on a long journey beyond narrow mental conditioning to the true, beautiful, and good.